Enjoy your first day of second grade~ 7 years old! Your trip to school may not be quite as exciting as the mice’s journey, but your school year will be full of adventures. We love you always and delight in seeing you grow. I’m still trying to decide which book to give him this year! Suggestions? 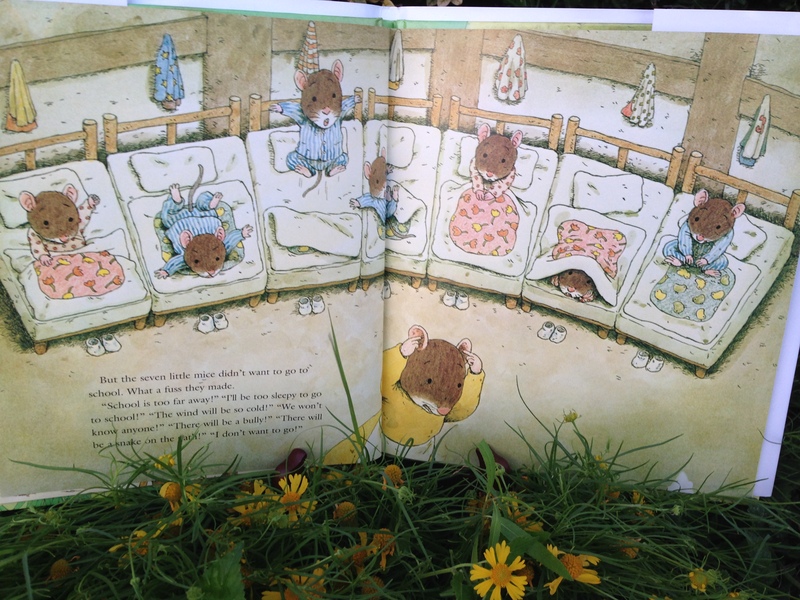 We mothers can relate to Mother Mouse in this story; we worry about our children, and we deeply feel what they are feeling. As Mother Mouse tucks her little mice into bed, their “first-day-school-fears” come flowing from their mouths. Mother begins to worry . 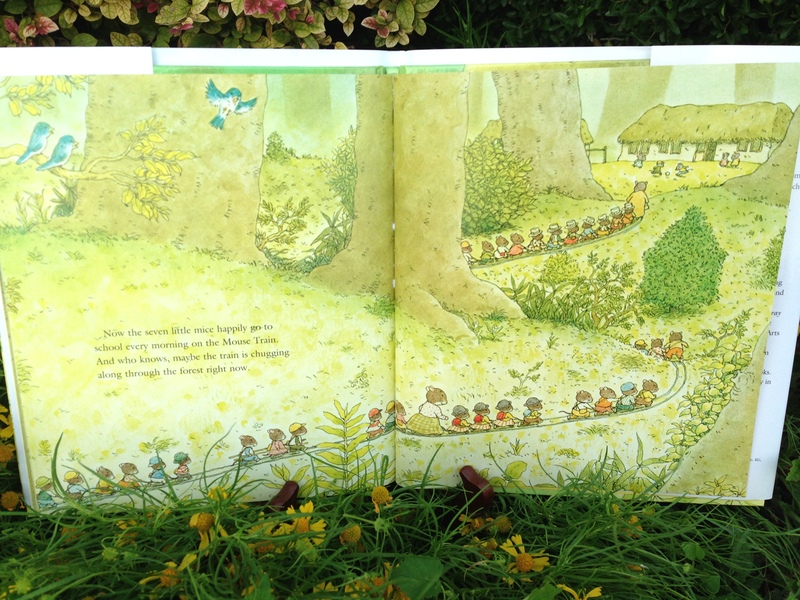 . . especially about how she’s going to get all seven little mice through the forest to the school house safely. Creativity paves the way! “That night she rolled two balls of blue yarn through the forest, all the way to school.” Perfect little train tracks. Curiosity gets them moving and in no time, they are ready for school, in line holding one another’s tail, and chugging down the track to school. Everything comes to a halt when they meet a snake in the tunnel. BUT, when the snake think he sees a “loooooooooooong snake”, he slithers off. 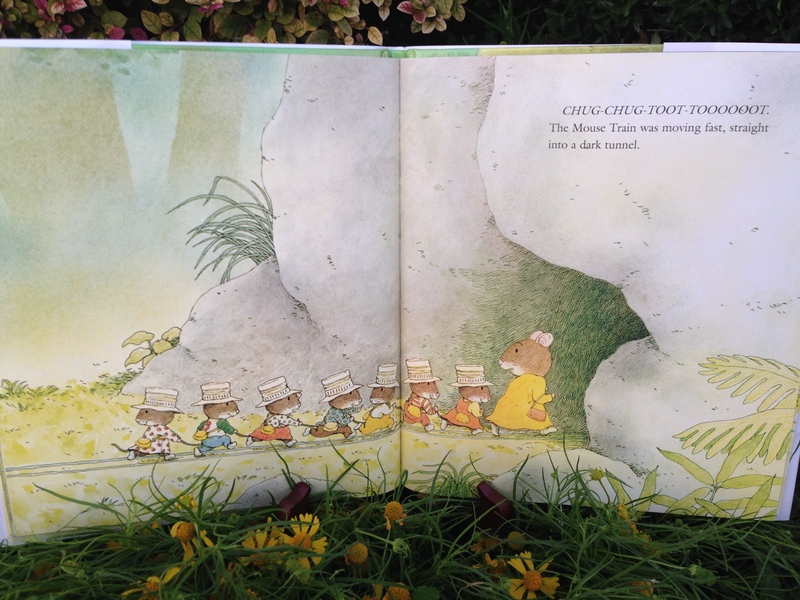 As the seven mice and their mother make it safely to the other side of the tunnel, they realize that curiosity got all the other mice in the town to line up in their train too, making the longest mouse train one has ever seen. F- How do you feel about the first day of school? R- Can you relate to any of the fears that the seven little mice share with their mother? I- Imagine you have to walk through a forest to get to school. What would you fear? E- Explore creative ways to overcome the main thing that makes you nervous about starting school. 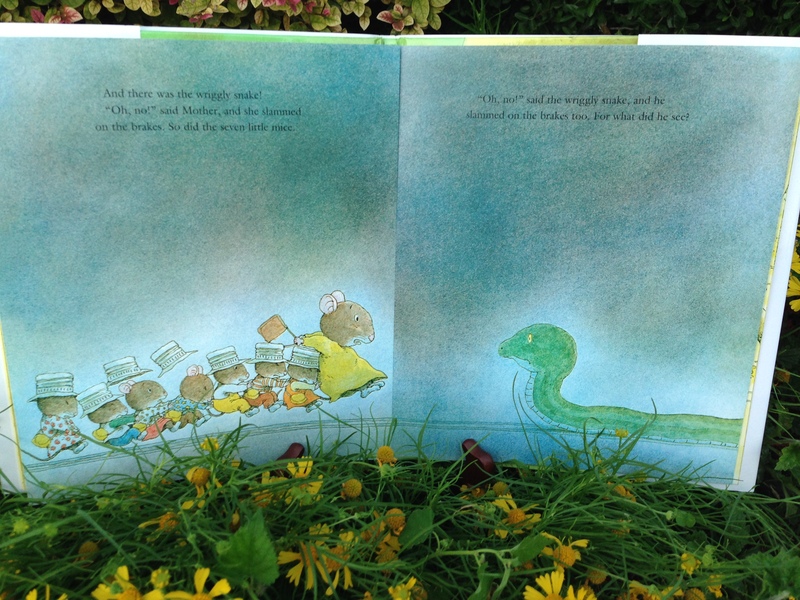 Mother Mouse comes up with a simple, creative way to help her mice not be so afraid. Can you create something fun to help you not be so afraid? N- Navigate the path for the mice to take to their school house by drawing your own picture. Add forest animals, trees, other mice joining their “train”, and anything else creative! Make it looooong so the snake will slither away! S- Share a special book with your children or class to get them ready for starting another school year. Also, share what you (parents and teachers) liked about your school year when you were in your children’s grade. Share your school picture so they know you were once a kid too! Pave the path for your kids’ first day back to school with some creativity! *Follow Kidsbook Friends on Facebook and at http://www.kidsbookfriends.com for more creative reading ideas! 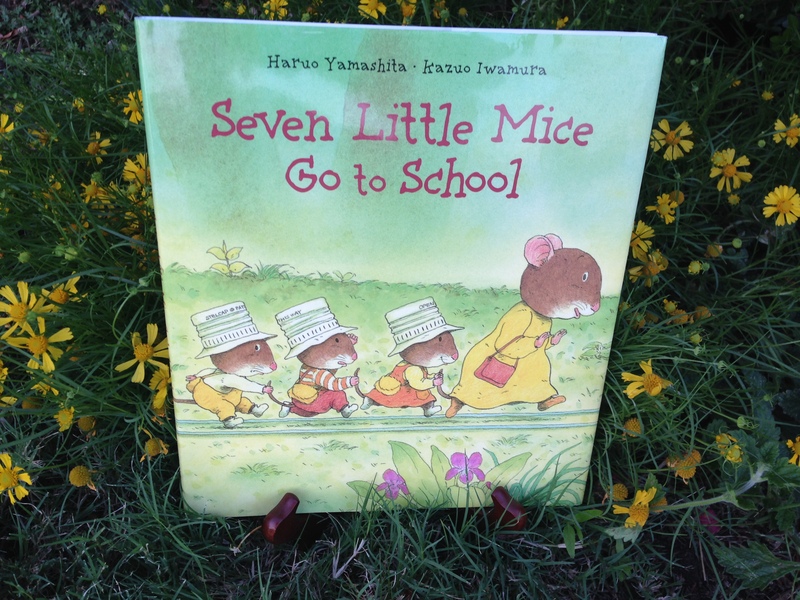 This entry was posted in school and tagged back to school fears, creative ways to overcome fear, First day of school, Haruo Yamashita, Kazuo Iwamura, North-South Books, Seven Little Mice Go to School. Bookmark the permalink.